Japan Australia suggested Hinamatsuri (雛祭り / Doll’s or Girl’s Day), Himure Hachimangu (日牟禮八幡宮 / a shrine in Shiga Prefecture), hiyashi chuka (冷やし中華 / chilled ramen), and Hikone (彦根 / castle town in Shiga Prefecture); Zooming Japan suggested Himeji (姫路 / a castle town in Hyogo Prefecture), Hikone, and Hiroshima (広島 / a city and prefecture in the Chugoku region); and Jay Dee suggested Himeji, Hikone, Hiroshima, Hikawa Jinja (氷川神社 / a shrine in Saitama), Hinamatsuri, hibachi (火鉢 / a traditional Japanese heating device), and Hikawa Kiyoshi (氷川 きよし / an enka singer). Hitsumabushi is one of my favourite Japanese dishes. It’s a kind of unadon (鰻丼) which is basically grilled eel (unagi / うなぎ) served on top of a bed of rice. 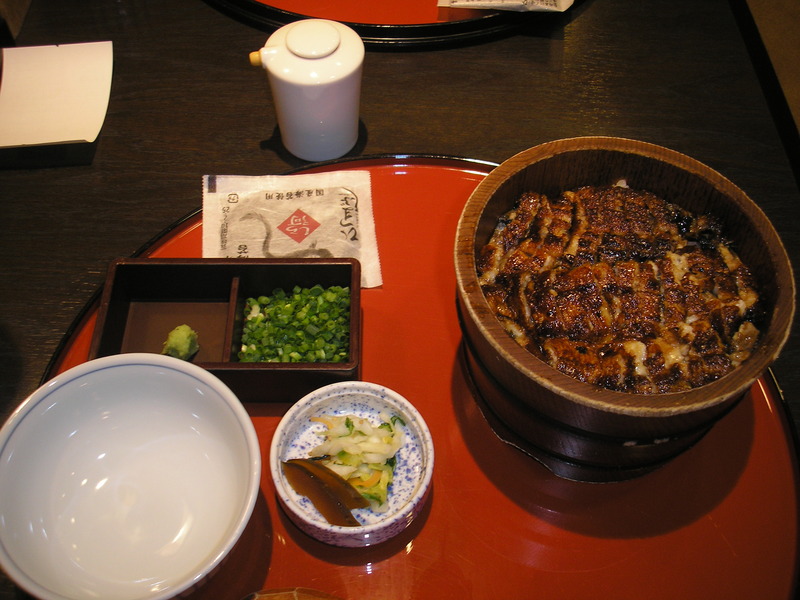 The eel is cooked in a style known as kabayaki (蒲焼), then glazed with a sweet soy-based sauce and caramelised. This dish is popular in Nagoya (名古屋), where I used to live, although you can buy it (and other kinds of unadon) all across Japan. As an ex-veggie who still doesn’t eat meat I sometimes find it hard to believe I like this dish so much, but it just has the most amazing flavour and it’s so delicious. It’s also really filling and gives you energy! Another interesting thing about Hitsumabushi is the ‘four ways of eating’. Rather than just tucking in, you are supposed to split the dish into quarters. You put the first quarter in your bowl, and eat it just as it is. Next, put the second quarter into your bowl and add the spices that are provided. The third section is eaten with broth, that will be given to you in a sort of teapot. Then, finally, you eat the last quarter in whichever way you liked best! Personally, I like the broth. If you want to try hitsumabushi, I’d recommend heading to Nagoya and finding a restaurant called Atsuta Horaiken Honten (あつた蓬莱軒本店). This is known as the best hitsumabushi restaurant in Nagoya, and because of its popularity you might have to queue for an hour to get in, but it’s absolutely worth it! When I went there you could put your name down on a list and go for a wander around nearby Atsuta Shrine (熱田神宮) while you were waiting, which was nice. 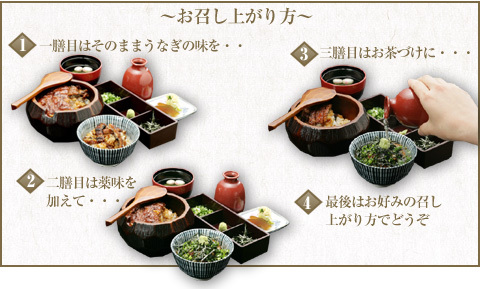 The restaurant’s website, in Japanese, is here. You might think that hitsumabushi would be more of a winter dish, as it’s hot and filling, but actually it’s commonly eaten in the summer because it’s thought to give you energy to survive the heat. In fact, there’s a day coming up soon on which you are supposed to eat unagi: Midsummer Day of the Ox (土用の丑の日 / doyou no ushi no hi). It looks like there are actually two Midsummer Days of the Ox this year – on 22nd July and 3rd August (I’m not sure why but it looks like there are two every other year and one on the years in between). I’d love to go and find myself some hitsumabushi (or at least some unadon) next Monday, but I’m not sure how easy that will be in Bristol. 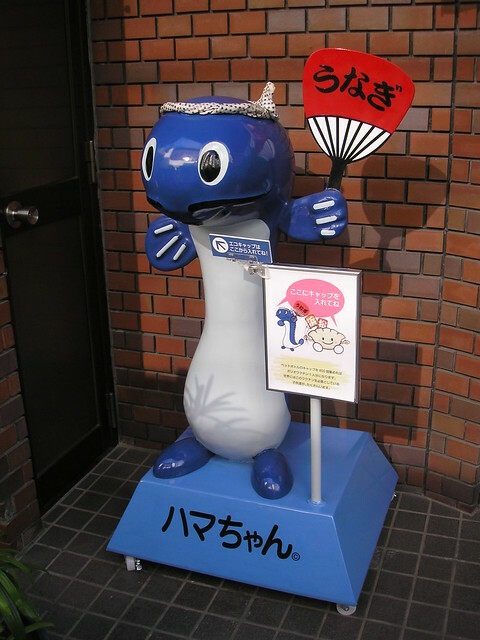 Eel is also a popular dish in Hamamatsu, where I lived as well! Next week we’ll start with ふ (fu), so please leave a comment below suggesting a topic for things beginning with ふ. Topics can be anything, as long as they are connected to Japan – food, places, people, characters, whatever you want to hear about! Just remember that the words you suggest must be Japanese words. Hitsumabushi is a popular dish here in Nagoya and unagi is believed to help withstand the hot and humid days of the Japanese summer. I haven’t had it yet this summer and I keep hearing that the prices are higher now as eel is becoming more rare. Thanks for the 'fu' suggestions! July is the main season for unagi, there’s lots in the supermarkets. Always a bit expensive, but it’s said to be good for your stamina. And you’ll definitely need it in the hot summer months. Yeah, it’s definitely my favourite dish! Fukushima, Fukuoka, furikake, Fukui, Fujisan, futon, fundoshi. Fufufu.